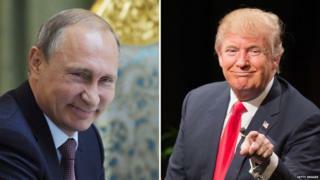 US presidential hopeful Donald Trump has said it is a "great honour" to receive a compliment from Russian President Vladimir Putin. The property tycoon hailed Mr Putin as a man "highly respected within his own country and beyond". It comes after Mr Putin said Mr Trump was a "very colourful, talented person" during his annual news conference. The two men, both known for their blunt manner of speaking, do not know each other personally. After hearing President Putin's comments on Thursday, Mr Trump released a statement praising the Russian leader. "It is always a great honour to be so nicely complimented by a man so highly respected within his own country and beyond," he said. "`I have always felt that Russia and the United States should be able to work well with each other towards defeating terrorism and restoring world peace, not to mention trade and all of the other benefits derived from mutual respect." Mr Trump is currently widely regarded as the frontrunner in the race for the Republican presidential ticket, a race where other candidates have made no secret of their wariness of Mr Putin. "I suppose [Putin] sympathises with Trump without knowing him well in person but he is following him closely, what he does and says, just because he is not a kind of usual Western politician," Alexander Baunov, an analyst at the Moscow Carnegie Center, told the Associated Press news agency. President Putin made his remarks during his televised annual news conference at which he used crude language to lash out at Turkey, a Nato member and key US ally in the conflict in Syria. But he had warm words for Mr Trump, telling viewers: "He says that he wants to move to another, closer level of relations. Can we really not welcome that? Of course we welcome that." In October, Mr Trump told US TV network CBS that he and Mr Putin would "probably get along... very well". During one presidential debate, he said: "If Putin wants to go and knock the hell out of ISIS [the Islamic State group], I am all for it, 100%, and I can't understand how anybody would be against it." One of Mr Trump's rivals for the Republican ticket, Jeb Bush, criticised his response to the Russian leader's remarks on Thursday. "A true freedom-loving conservative wouldn't be flattered by praise from a despot like Putin," he wrote on Twitter. The cordiality between two of the world's most visible politicians was mocked in some quarters of the US media. "The two men share a love for spectacle and an appreciation of its ability to move low-information voters," Christian Whiton wrote on CNN, while the New York Times detected a "long-distance bromance".